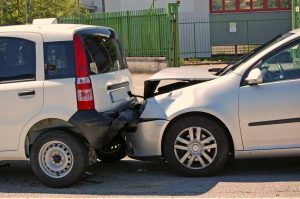 Rear-end collisions are among the most frequently occurring types of motor vehicle accidents in the U.S., according to the National Highway Traffic Safety Administration (NHTSA). While these crashes commonly result in property damage, in the most severe collisions, people can end up sustaining major and potentially catastrophic injuries. Shedding some light on the incidence and impacts of rear-end collisions in the U.S., in this blog series, we will discuss some important facts about these types of traffic accidents. If you have been hurt in a rear-end crash or in any type of motor vehicle accident, however, you can turn to trusted Colorado Springs Car Accident Attorney Kenneth Shakeshaft for help with your financial recovery. 1 – Close to 1 in every 3 traffic accidents in the U.S. is a rear-end collision. Every 17 seconds, a rear-end collision occurs in the U.S. Here are more important facts about rear-end collisions. Contact us for help with your financial recovery after any traffic accident. In fact, while the NHTSA reports that nearly 30 percent of all motor vehicle accidents in the U.S. are rear-end collisions, researchers have extrapolated the fact that, about every 17 or so seconds, one rear-end crash is reported in the U.S. What may be more shocking that this is the fact that one unreported rear-end collision occurs in the U.S. about every 9 or so seconds. 2 – Younger motorists are most often those responsible for causing rear-end collisions. Interestingly, the NHTSA has analyzed the incidence of rear-end collisions, according to the age and gender of motorists. What transportation safety regulators have found is that, in general, younger drivers tend to be the ones who are most often causing rear-end collisions. The chances of drivers causing rear-end collisions decrease as motorists’ ages increase and they gain more driving experience. Male motorists generally tend to more often be those in the “striking” role of rear-end collisions, as opposed to female drivers. Given the fact that rear-end collisions often happen at intersections and/or other areas where a complicated set of driving conditions is constantly changing, it’s likely easier to see why less experienced motorists are far more commonly the ones who are causing rear-end collisions. We’ll resume this discussion regarding rear-end collisions in the additional parts of this blog series that will be published soon. We encourage you to check them out! Have you been hurt in a rear-end collision or in any traffic accident? If so, Colorado Springs Car Accident Attorney Kenneth Shakeshaft is ready to advocate your rights, help you hold negligent parties accountable and ultimately help you put your life back together. To find out more about how Attorney Kenneth Shakeshaft can help you, schedule a free initial consultation with us by calling (719) 635-5886 or (800) 383-5886. You can also email us using the contact form on this page. We don’t get paid unless or until you get paid, so you have nothing to lose and everything to gain by contacting us today.